This headstone in York Cemetery marks the resting place of one of the casualties of the ‘Baedeker raid‘ on 29 April 1942. 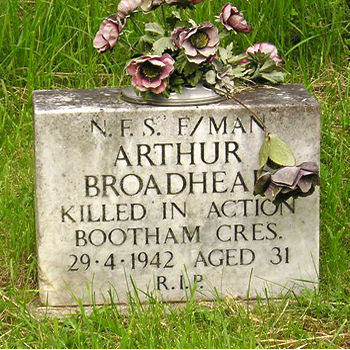 Arthur Broadhead was a fireman with the National Fire Service, and died while carrying out his duties that night – ‘killed in action’, at Bootham Crescent. Arthur Broadhead, Mr Colman and others are included on the casualty list for that night. Other NFS firemen lost their lives in York during the war years. Robert Sunderland, aged 63, of Etty Avenue, died 21 Sept 1941, in the River Ouse. Sidney Thompson, aged 33, of Rectory Gardens, died 2 Aug 1942 in a fire float at King’s Staith, near Ouse Bridge. Both are recorded on the Commonwealth War Graves Commission searchable database. More information regarding the raid in which Mr Thompson was killed is available on the York Air Raids pages: 2 August 1942 report.